The Montessori pedagogy, designed by Dr. Maria Montessori, has more than 100 years in business, is the most widespread global pedagogy. The central idea is the absolute belief that the child can better develop their skills and values ​​to the extent that the social environment in which it is developed is suitable for learning. There are over 22,000 Montessori schools in the world. It is more applied pedagogy worldwide. The Montessori method sees human development as a process. Seeks the development of personality. Focus on the whole child: it focuses on the development of the “whole child”, emotionally, physically, socially and academically. Dr. Montessori believed that no human being can be educated by someone else. Each individual has to do things for yourself to learn power. Children are motivated from within by a natural curiosity. The goal of education should not be to fill the child with selected academic data, but to cultivate their natural desire to learn. 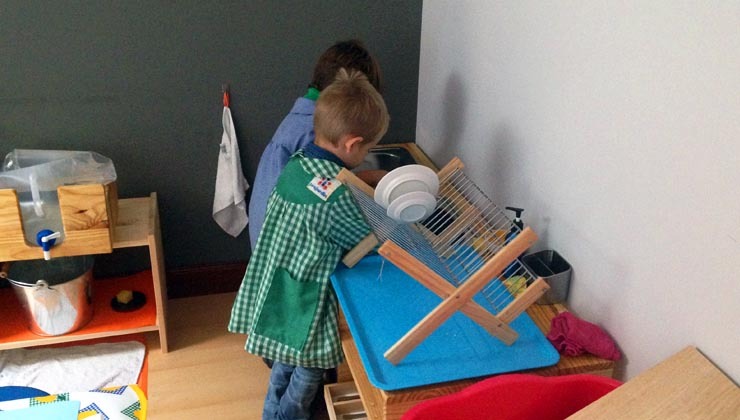 The use of materials is based on the child’s desire to learn, fitness M. Montessori identified as the “absorbent mind. We believe that children / as developed in educational environments that respect them as individuals. The Montessori pedagogy is based on a deep respect for the personality. Children work on their free choice. We firmly believe in the potential and possibilities of each child / a and we are committed to defend and promote them. We support them with their companions and guides for the discover and develop. We propose a learning and development focused on each child / a, so that its potential to be cared for, valued and heard from their differences. A prepared environment: appropriate to the needs of children and their development with Montessori materials and furnishings appropriate to the age; It is a physical and psychological space scientifically designed to provide the child with opportunities to learn through personal experiences. In Montessori classrooms are spacious and bright. They include flowers and plants in an absolute order. The environments are designed to stimulate the desire for knowledge and independence in children. In addition, children can exchange ideas and experiences in the midst of an environment specially prepared for them, furniture, materials and infrastructure at its disposal. * Provided: The size and strength of the child. * Limited: Regarding the same environment direct the child towards knowledge and help you organize his thoughts and clear your mind. * Simple: The quality of things and the line forms. Elemental, there must be enough and necessary. * Telltale error: The power realizing the mistake leads the child to an increasing reasoning, can measure the consequences of their actions. * Washable: For the child to keep the environment clean and care. Equipment or means of development. Designed by Dr. Montessori, the material is called “Development Environment”. It covers all areas in which she studied the child’s needs. All material is natural, attractive, progressive and with its own error control. Children are introduced to a vast variety of materials to give a solid foundation to all skills and human intelligence. In the rooms, materials are distributed in different areas where children have free access and where they can choose the activity you want to do. The materials were developed scientifically appropriate to the size of children, all have a specific learning objective and are designed with natural elements like wood, glass and metal. These movements led by demand intelligence to a defined purpose and are a point of contact between the child’s mind and external reality, gradually allowing more difficult exercises. 1. All materials are matters of activity. 2. Isolate the qualities we want to highlight or the child learns. 3. Some, like sensory materials and mathematics, are graduates. 5. They have a maximum and a minimum and have opposite. 6. They have a limit: There is a material everything. 7. Help your child understand what you learn, by associating abstract concepts with a specific sensory experience, and really are learning and not just memorizing. It is considered the most important part, helps children develop coordination, concentration, independence, order and discipline. Exercises encompasses social relations, tolerance and courtesy, perfect control and refinement of movement. It refers to the development and refinement of the five senses: sight, sound, touch, smell and taste. The purpose of the exercises is to educate the senses, so the child can learn about the environment, and be able to discriminate its finer points. The first step toward reading and writing is sensory. Children use your index finger to sensory know each letter through the use of letters outlined with sandpaper. This helps them to recognize geometric shapes, while developing their skills and learn the lyrics phonetically. Finger then replaced by a pencil to later write. The learning of reading and writing is done on the child naturally. To live together and exchange experiences with older partners who already read and write, conducive to the child his desire to do so. According to the skills and interests of his age, an atmosphere that favors their development it will be created. Again the introduction to numbers and mathematics is sensory. The child learns to associate numbers to quantities, gradually moving to more abstract forms of representation. Early education in this sense, helps the child to lay the foundation for reading and learning of mathematics. The activities developed with sensory materials make the child pass “from the concrete to the abstract” and allows us to discriminate sizes, colors, shapes, weight, etc. A / guide a trained adult who knows the child, respects and follows through his experience Dr. Montessori always referred to teachers as “guides” and their role differs considerably from that of the traditional teacher. She first of all has to be a great observer of individual interests and needs of each child. Our way of ensuring established standards of Montessori is to consider that all our guides have the AMI degree. The Montessori training for Montessori qualified guide through the AMI (Association Montessori International), is performed through a program of training and rigorous training where the characteristics of child development and needs are studied. The curriculum and materials associated with different age groups and the complementary skills of respect and support the development of children’s autonomy. Besides the constant self-observation and self-awareness guide. 1. Thorough understanding each intellectual, physical and psychological development in each period the child needs. 2. Must be able to guide the child in the classroom to the material or activity that is required to achieve a harmonious development and age appropriate. 3. Know and properly manage the use and objectives of each material found in space. 4. Indicate clearly and precisely the use of objects and materials so. 5. Be active when you put the child in contact with the material first and passive when contact has already been given. 6. You must always keep the environment clean and tidy. 7. Attend and hear where they called and respect the work and the mistakes of those who work. 8. They should awaken the child, independence and imagination during its development. 9. Build on the self-discipline, kindness and courtesy. The child: his whole life was devoted to know the child. He saw that all children go through the same stages of development, regardless of their culture. Evaluation in Montessori philosophy is consists of a system of records of information, among which we find: diagnosis, evaluation, data, measurements, reports of professional conduct, reports and opinions of parents, who provide us with a command of complete history of each student / a. Each student / a is evaluated by all teachers, by teachers of special classes, by the director and specialists working in it. Each evaluator performs work particularly in writing, then all views, opinions and approaches are combined, analyzed and exchanged insights, enrich and specify the information, and the result gives a profile “Custom” ( because each person is made, where everyone has their space and particular attention) and “personalist” (that is oriented towards enhancing the attributes of each student / a that has been endowed by the Creator: the will, thought, language and freedom). Continuity, repetition, perfect order and completion of the work, tracking down to the smallest detail, the reverential respect for the child / a, the close connection with the familiar reality and attention to considerations of parents and mothers; It allows each guide achieve stability and normalization of the attitudes of students in the learning process. The environments are scientifically designed to promote the development of the child’s mind and awaken in him the normal characteristics of his childhood love of order, love of work, spontaneous and deep concentration, attachment to reality, love of silence, ability to work alone, overcome the possessive instinct, joyful obedience, independence, initiative, ability to cooperate and help each other, self-discipline and joy. Continued work within such a well structured and managed environment, modifies largely inappropriate behavior of children, counting, of course, with the cooperation of parents in the systematic realignment of family organizations. Prepared for the environment constitutes an effective therapeutic monitoring carried the child to the normalization of their behavior, allowing you to develop your potential and their unique capacity for creativity. Individual stimulation: The most notable difference between a traditional school and a Montessori school is that students move at their own pace. Instead of participating in a class or activity directed by the teacher, where all students perform the same tasks for each student works on lessons that are precisely tailored to your skill level and autonomous choice. Mixed age groups: Children make a model for other children: improves learning, social and emotional development. Older students often naturally take leadership roles and help establish the work environment. Younger students also find a way to lead, either through their growing knowledge in a certain area, a special, or its own unique set of social skills talent. Concentration: The child who knows the state of concentration, peace, tranquility, looking to meet again in that state. Through the atmosphere preparation and handling of it, the child is free to choose the material in the interest and concentration achieved through movement, through action. This philosophy is evident in the way students are treated. If a child is distracted or having trouble concentrating, the guide did not rebuke. Instead, it is to rekindle your interest, determine what it is confusing, or help you find another job that is most appealing. Students are also given a lot of responsibility to maintain the classroom, planning meals and snacks, and work through problems as they arise. • An environment without competition: In the Montessori classroom there is no competition because children work individually with materials. Each child activity relates to their own work and not that of others.